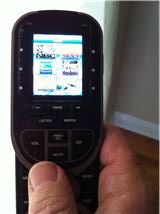 The new remote is really awesome. 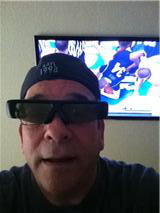 (I only say awesome when I have my Blu Blockers on). Pre-programmed for everything, it can play every station, movie and i tune on my system. AND ... I can turn on anything I want in any room of the house ... (why I would want to do that I don't know ... but I have that ability). Josh got me Apple TV for Christmas. It is REALLY awesome. Scary awesome because I think it has now Genius-ed itself into telling ME what to watch and when. I had to put a picture of beer here. Personally, I'm a scotch drinker ... but of course, in a man cave, beer is a necessity. 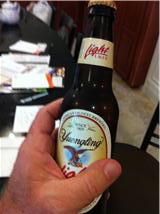 Yuengling Light, I never heard of. Someone left a six pack here after a party in 2009. Still good though ... huh? 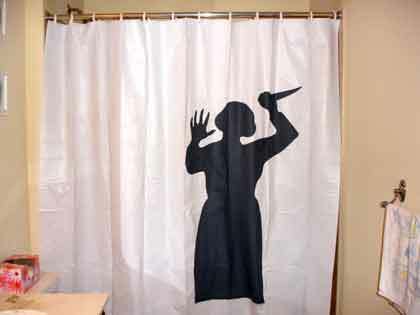 We took this off the shower bar to put up over the sliding doors. Just kidding, I like this picture and think it's a great deterrent for visitors. We really have bed sheets ... sorry ... Debbie says bed sheet "window treatments". I think they are gonna be replaced but they work for me. Oh, I forgot to give an update on the rest of the house. It's ... coming along. all you need is a pool table and a back scratcher. @Gillian ... In that order! Sounds positively manly! You look like a member of Devo. @Chrissy ... Devo huh? There is a resemblance.